Warsaw’s mayor has banned a far-right march planned for Sunday to mark the centenary of Polish independence, citing the risk of violence and expressions of hatred. Organizers said they would defy the ban. They lodged a court appeal against the decision to shut down the annual Nov. 11 event commemorating the anniversary of Poland’s independence at the end of World War One. Tens of thousands of participants had been expected to attend, including far-right activists from elsewhere in Europe, with organizers claiming the event could be the biggest such march in Europe in years. 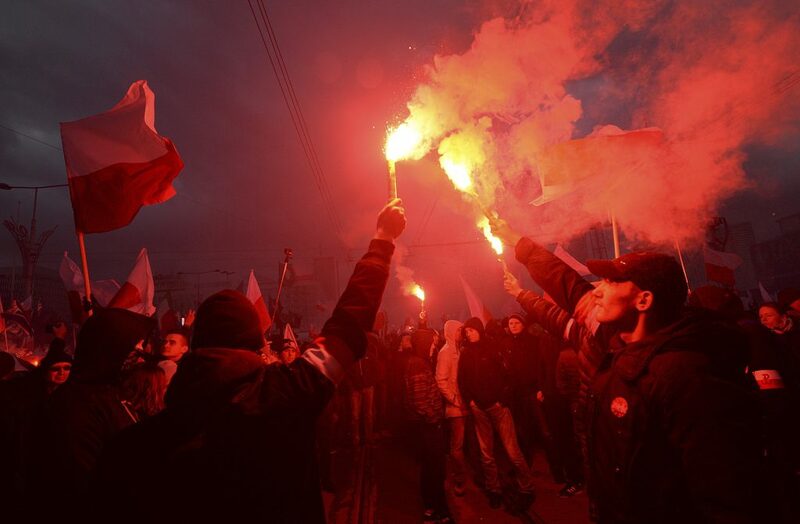 Last year’s event caught the attention of the world’s media because some of the 60,000 participants carried banners bearing racist and xenophobic slogans such as “pure blood, clear mind” and “Europe will be white or uninhabited”. The Eurosceptic Law and Justice (PiS) party government said it would organize its own march instead, under the auspices of President Andrzej Duda, a PiS ally. Officials did not clarify whether far-right groups would be allowed to attend. Duda had earlier decided to stay away from the event. “We don’t understand the decision of Mayor Gronkiewicz-Waltz … Even if the courts confirm her decision, we will still meet … The march will take place,” said Tomasz Dorosz, the leader of Poland’s National Radical Camp, one of the groups involved in organizing the march. Earlier this week Gronkiewicz-Waltz said she would consider banning the march “if there was any element of hatred”, according to local Polish broadcaster TVN24. PiS, a socially conservative group with a nationalist agenda, taps into the same frustrations with western liberal values and anti-establishment sentiment that galvanize far-right voters throughout Europe. It has also refused to take in Middle Eastern and North African migrants, despite European Union demands to do so, citing public safety worries. However, Jaroslaw Kaczynski, who heads the ruling party, condemned the racist messages during the 2017 march. “Polish tradition – the one we invoke – has nothing to do with anti-Semitism, we are as far as possible from that, nothing to do with racism,” he said. On Nov. 11, Poles commemorate the establishment of the second Polish republic in 1918 from territory seized in the 18th century by the Russian, Austrian and Prussian empires.